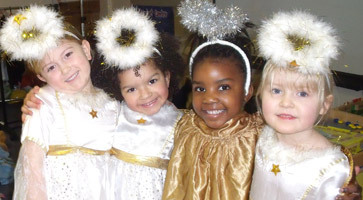 These four little angels appeared in Reception’s Nativity play at Rose Court. Each class in the school has been entertaining family and friends with Nativity plays and concerts. The youngsters also staged their annual carol singing outside the school, which is always a popular event. The angels are (L-R) Rosie Sutton, Raphaelle Oakes-Watkins, Luyanda Khupe and Olivia Watson.